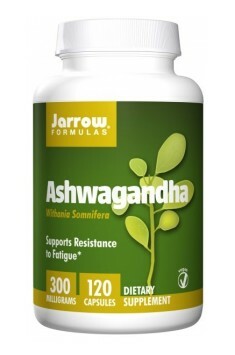 Jarrow Formulas Ashwagandha is a dietary supplement with an extract of Withania Somnifera root, a flagship herb in Ayurveda - traditional Indian medicine. It has been known for centuries but it is just now, thanks to the development of sciences, that the plant is becoming more and more popular all over the world. It is believed to have a very wide range of uses, like supporting the organism in many areas, including: the immune, nervous, endocrine, respiratory and circulatory systems. It is worth mentioning that ashwagandha is used by sportspeople in order to increase their physical capacity and strengthen muscle tissue. KSM 66® is an ashwagandha extract created by Ixoreal Biomed, standardised at the content of bioactive substances, i.e. withanolides. It was developed in a 14-year-long process based on tests and studies whose aim was reaching perfection. Created only with the use of Withania Somnifera roots, it is the product with the highest concentration on the global market. It is produced in the process of extraction according to the rule of "green chemistry", without the use of alcohol or other chemical solvents. Ashwagandha owes its properties to the content of many active components, the most important being withanolides and alkaloids (anapherine, anahygreine, withanine, somniferine, tropine). Ayurveda experts and doctors stress, however, that the plant's therapeutic effect stems from a much richer content. Other components found in ashwagandha extracts are: flavonoids, saponins, glycosides, coumarins, phytosteroles, minerals, iron, choline and essential oils. Withanolides are the most important bioactive components in ashwagandha root. Up to now, more than 140 withanolides have been isolated from the plant and analysed. They are thought to have anticancer, antimicrobial, cytostatic, calming and blood pressure reducing properties. The one that has been tested the most is withaferin A, whose proven anticancer effect is the inhibition of the factor Sp1. The transcription factor Sp1 supports the maintenance of telomerase activity in cancer cells, thus contributing to their immortalisation. Flavonoids are famous antioxidants that eliminate the activity of reactive oxygen species, which can contribute to the prevention of some lifestyle diseases and the beneficial effect on the organism's health. Coumarins are said to have a calming, antispasmodic, anticancer, antioxidant, antimicrobial and blood vessel dilating effect. The substance is also used in the production of anticoagulants, whose structure is similar to that of vitamin K.
Consuming phytosteroles is recommended for preventing ischemic heart disease (IHD) and hypercholesterolemia. Consumed with vitamins C and E, they are believed to inhibit the process of platelet aggregation, which can be related to the reduction of the concentration of total cholesterol and its LDL fraction in the blood. Choline is the precursor of acetylcholine, one of the main neurotransmitters and phospholipids that build cell membranes. That is the components main purpose and thanks to those properties it has a beneficial effect on CNS. Its deficiencies can lead to nervous system and skeletal muscle disorders. According to some sources, taking Withania Somnifera extract in the dosage of at least 500mg for 4 to 8 weeks caused increased sensitivity of serotonin receptors, which bind serotonin. That activity can turn into better well-being, an antidepressant and anti-stress effect, improved memory and learning processes and eliminated mental symptoms of neurodegenerative diseases. Several experiments have been conducted so far when it comes to the extent of the influence of ashwagandha supplementation on exercise parameters and aesthetic silhouette both in sportspeople and in regular people. Using 500 mg of ashwagandha extracts for 8 weeks caused a 7.6% muscle strength improvement and a 6.6% increase in aerobic capacity in young people of both sexes who were not physically active. Another 30-day experiment on 18 young volunteers (18-30 years old) caused an increase in muscle strength by 6%, muscle mass increased by almost 4 lbs and, at the same time, fat tissue reduced by 2.3%. Conclusion: it is possible that ashwagandha increases muscle strength and mass, improves aerobic capacity and supports the reduction of redundant fat tissue. It is said that ashwagandha is an adaptogen. Adaptogenic activity consists in alleviating and preventing the consequences of physical and psychological stress caused by harmful factors in our environment. Adaptogens regulate the activity of the central nervous system, they can increase the level of the organism's adaptation to heavy physical and intellectual effort. These days, because of frantic lifestyles, a burden of duties and bad diet, people can be tired, weak and nervous. In such moments we seek help and go for adaptogens. Ashwagandha by Jarrow Formulas is a dietary supplement recommended for people who live in constant stress, are overworked, exhausted, have problems with sleep and suffer from lowered mood. Thanks to the content of many active compounds with healthy properties, the product contributes to improving the organism's health and, as a result, life-quality. Produkt działa zgodnie z opisem :) fajny stosunek ilości do cenny. Polecam 2 kapsy przed snem. 1 capsule 1-2 times per day with water. It is believed that 300 mg (1 capsule) of Ashwagandha is enough to increase immune system and adaptation capacity. At higher exposure to stress higher doses are recommended - 600 mg (2 capsules). Ashwagandha has a calming and sedative effect, this is why the product is recommended to use especially for the night. For substances with adaptogenic effects, we recommend to replace the product every two months. And also it is not recommended for use with sedative drugs. One of the strongest antioxidants. Each portion contains 500 mg of vitamin C.
Vitamin C is one of the best antioxidants for fighting free radicals, supporting immune function. Guggul extract standardised to the content of guggulsterones, which promote thyroid function. Natural phytoestrogens from soybean that help to relieve the menopause symptoms.